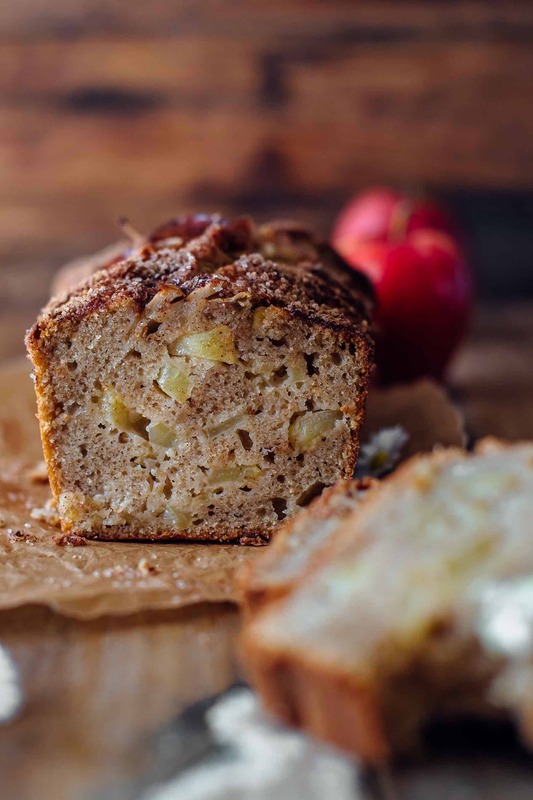 This is the moistest and most delicious Cinnamon Apple Bread! It’s loaded with flavors and easy to make. Made with real apples and applesauce. I’m totally obsessed with fall flavors. Apples and pumpkins are frequently on my table. And both are great to bake with. 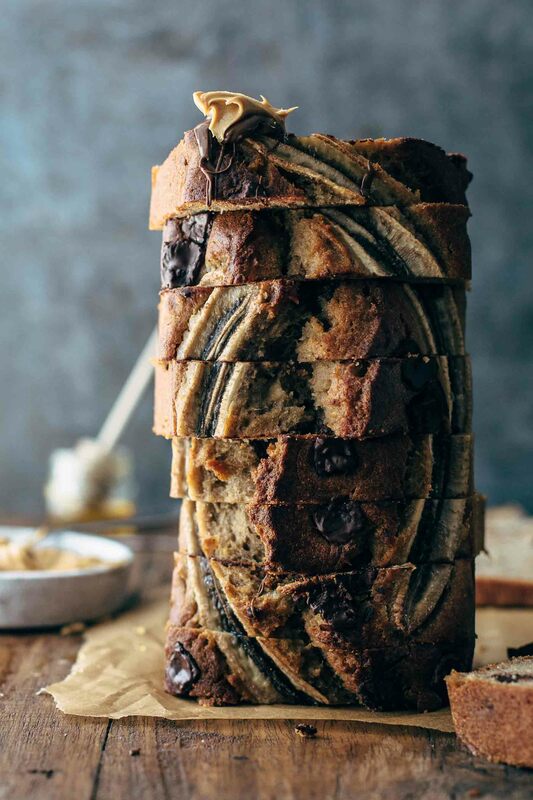 One of my absolute favorite breakfasts for weekends is good old banana bread with chocolate chips in it. That was the inspiration to that recipe. I thought: hey, why not make a banana bread just with apples? An Apple Bread. 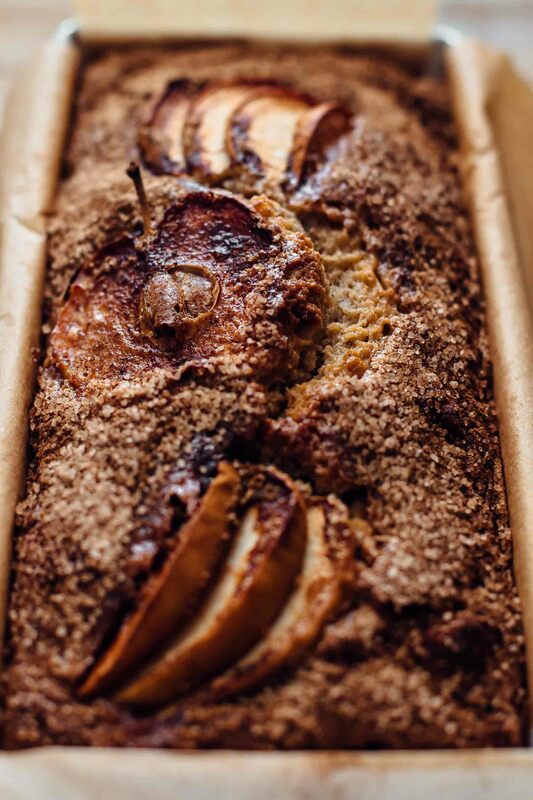 And because apples and cinnamon are best friends, it had to be a Cinnamon Apple Bread. No joke, I eat apples every day, all year long. But this is not really the truth, I drink apples every day rather than eating them. Mario and I always make fruits and vegetable juice in the morning to get a load of vitamins to start the day full of energy. 2/3 vegetables and 1/3 fruits. So the main part is vegetables like tomatoes, celery, fennel, cucumber and so on. The fruits part is everything that is seasonal and apples. Apples have a great taste and make the juice so delicious. I love to bake with apples. They give a great and sweet flavor to any baking goods and fit perfectly to everything with cinnamon or caramel, and also very buttery treats. AND bread. Like this one. And what else about apples? Apples are just beautiful. Look at the picture below and tell me that you don’t want to bite into these apples. Speaking of apples. Especially the big apple. In November, I’m on a business trip to New York for three days. I’m going to work for a half day but decided to stay 3 days to explore Manhattan. Mario comes with me. We’re so excited. We already planned our whole trip where to go and much more important, what to eat. 3 times lunch, 4 times dinner, and 3 times breakfast or dessert. I can’t wait for Dough Doughnuts, Supermoon Bakehouse, and Dominique Ansel Bakery. It was a super hard decision what makes it on the list and what doesn’t. We wish we could eat 10 times a day to try everything we would love to try. For lunch and dinner, we decided to go to Katz’s Delicatessen, Keens Steakhouse, Five Guys, Shake Shack, Gray’s Papaya, Taqueria Diana, and Motorino. Normally I love unplanned trips where I just explore the real life with the locals. We did this in California last year, and we loved it. But because we don’t know when we will be in New York the next time, we want to make sure to see what Manhattan is known for and to eat what Manhattan is known for. Ok, Five Guys and Shake Shack is not a Manhattan thing but we love Burgers, and we don’t get good ones here in Austria, so we really want to have 2 times burger on our food list. But Katz’s, Keens, and Gray’s Papaya is something what Manhattan really is known for. We appreciate any other advice for eating in Manhattan. Enough from the big apple. Let’s come back to real apples. 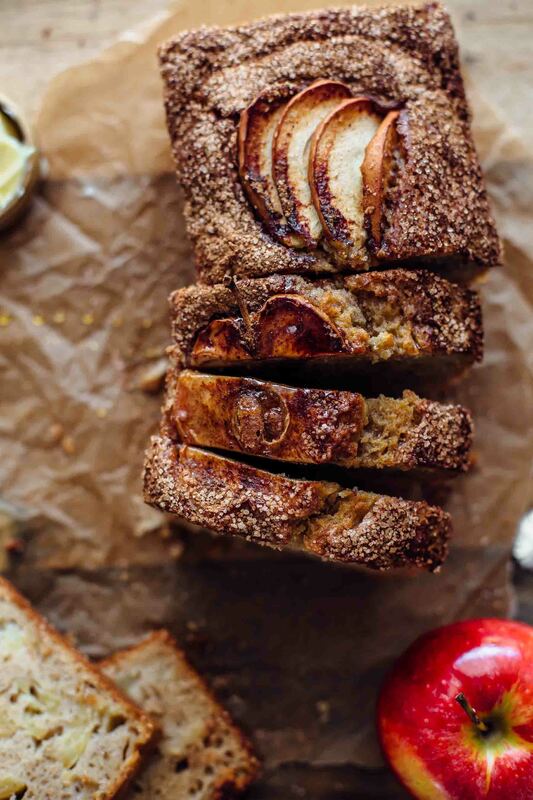 This Cinnamon Apple Bread is really easy to make. Combine flour, baking powder, cinnamon, and salt. Set aside. In a large bowl, mix applesauce and sugar. Slowly add oil. Then eggs and vanilla. Add dry ingredients and stir to combine. Fold in apples. Transfer to a baking loaf pan and sprinkle with cinnamon sugar. As you can see in the pictures, I topped my Cinnamon Apple Bread with a few apple slices for decoration. You don’t need to do that. It’s optional. What is not optional is the cinnamon sugar on top. It forms a sweet, crunchy crust during baking. 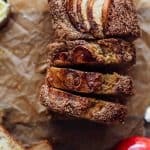 When you bite into the top of the bread, you have the soft and moist apple bread and also the crunchy topping in your mouth. It’s heavenly. I decided to add applesauce to the batter to get a nice and intense apple taste. It also adds great moisture to the bread that leads to a super soft crumb. I also added chopped apples to the batter. 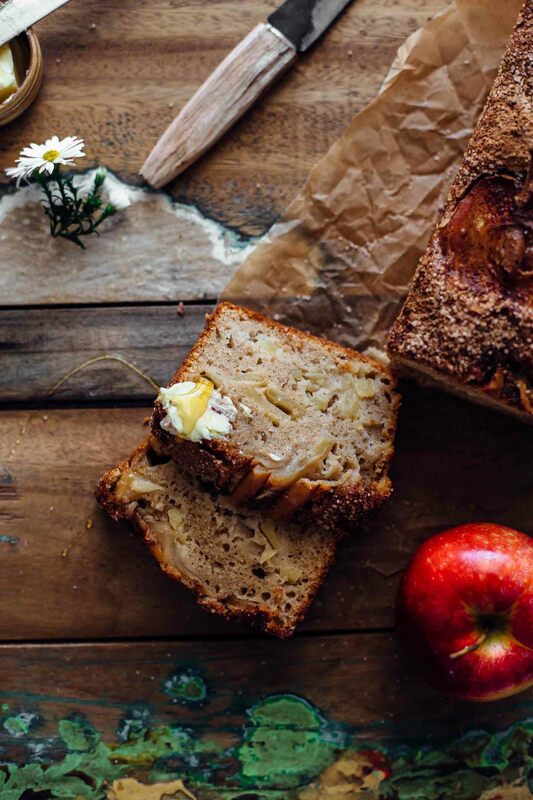 It’s really essential to have both for the best possible Cinnamon Apple Bread experience. Would you prefer a slice for breakfast or dessert? 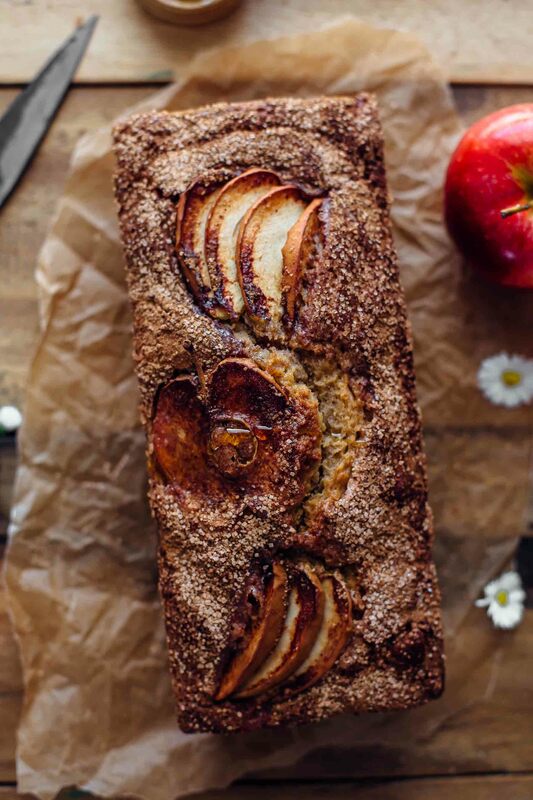 If you make this Cinnamon Apple Bread recipe leave a comment, rate it and tag a photo #alsothecrumbsplease on Instagram! Would love to see your snap! You may also like Chocolate Peanut Butter Banana Bread, Cinnamon Challah Bread, Caramel Apple Cake, Apple Strudel Cinnamon Rolls, or click here to see all recipes. 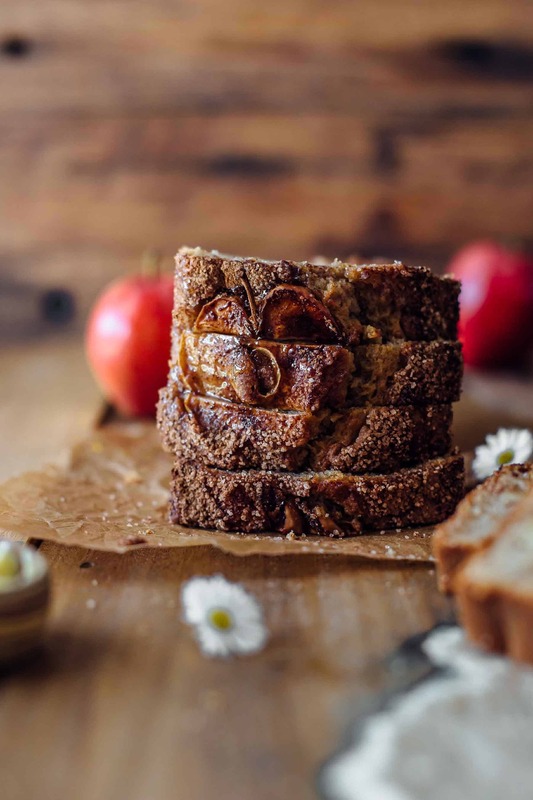 This is the moistest and most delicious Cinnamon Apple Bread! It's loaded with flavors and easy to make. Made with real apples and applesauce. Preheat oven to 350°F (175°C). Line a 9x5 or 8x4 inch loaf pan with parchment paper with an overhang on all sides to easily lift the bread out of the pan after baking. Set aside. Combine 2 tbsp white sugar and 1 tsp cinnamon in a small bowl. Set aside. Combine flour, baking powder, salt, and cinnamon in a small bowl. Set aside. 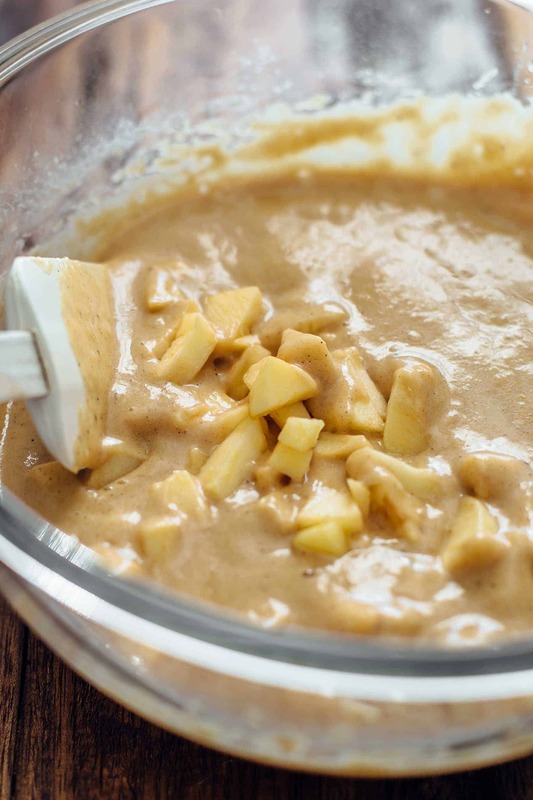 In a large mixing bowl, using a handheld or stand mixer fitted with a paddle or whisk attachment, mix applesauce and brown sugar just until combined for about 1 minute. Turning mixer to low, slowly mix in oil to combine. Add eggs and vanilla* and stir just until combined for about 1 minute. Add flour mixture and stir to combine. Don't overmix at any step. Fold in chopped apples just until combined. Transfer batter to prepared loaf pan and top with cinnamon sugar mixture and additional apple slices if desired. Bake for about 55-60 minutes or until a toothpick in the center comes out clean. Let cool in the pan for 30 minutes. Then transfer to a wire rack and let cool completely. Store in an airtight container at room temperature for up to 2 days. Red Delicious. Crunchy and Mildly Sweet. Gala. Crisp and Very Sweet. .
Golden Delicious. Crisp and Sweet. Do you have any preferences in apples? Also, I am so excited you are coming to New York for a few days. If it is related to your up-coming move, I hope everything goes smoothly with all of the paperwork you must be filing. Finally, I know it is probably wrong, but there is a very nice fellow baking blogger, https://www.instagram.com/jillianhatsumi/, who just happened to return from a NYC trip. She has some great tags on her Instagram like Two Little Red Hens Bakehouse. From what you have on your itinerary, I am sure you already have more than enough to fill your plates. I hope you and Mario have an excellent flight and trip. This bread is not that hard to make. It is definitely worth to give it a try. My favorite apples are Golden and Red Delicious. 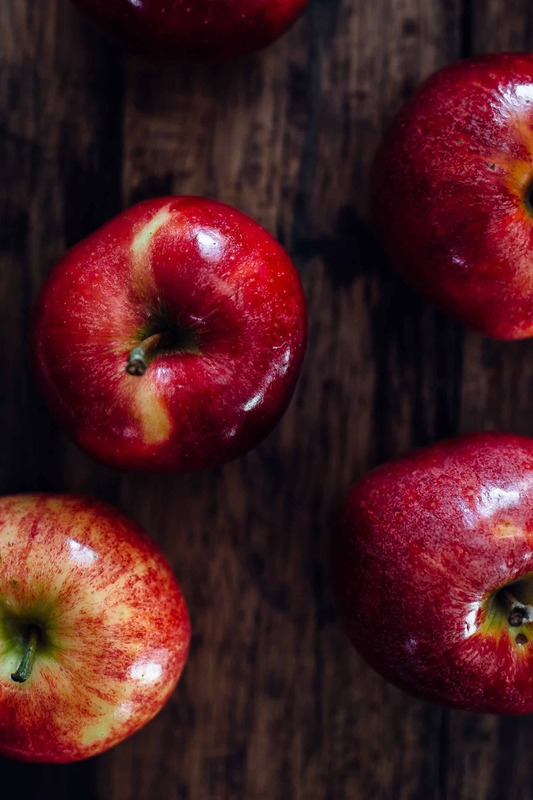 These are great apples for almost everything. Thank you for the tip! I will check her Instagram and look if I add replace something from my list. I’m sure I will gain a ton in these few days. Hungry or not. I will eat it all (: Thank you so much, Amanda! Have a great day! The bread looks amazing and I can smell the cinnamon goodness here too. I have a question though, how do you keep apple slices on top of bread from sinking? Thank you so much! The batter is thick enough that the thin apple slices don’t sink down. Hi Rachael, I’m sorry that it turned out differently. Baking with GF flour is different than baking with regular flour. When baking with GF flour you need more liquid. A substitution of regular flour to GF flour 1:1 is not possible. However, I can’t give any recommendations on how much flour would be right because I’ve never baked this recipe with GF flour. Honeycrisp is an excellent choice. My favorite. The texture with regular flour is soft and moist. Like banana bread. And yes the ingredients are correct. I checked it again. Delicious is all that I have to say! I didn’t change anything and it came out perfect. I’m so happy that you like it, Lin! Thank you so much for the feedback! Super delicious and easy to make! Thank you so much for your feedback! I’m happy that you like it!